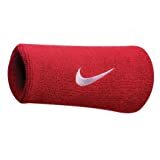 The Nike Swoosh Double-Wide Wristbands have the following features: These Nike wristbands are extra wide, comfortable sweatbands, made ? ?of soft terry. The wristbands come in pairs, have a width of 12.7 cm and feature an embroided Nike Swoosh. Specifications: Double-Wide Nike wristbands Embroided Nike Swoosh logo Comfortable soft terry :Width: 12,7cm Color: black – white Tags: wristbands, sportbands. This entry was posted in Tennis and tagged Doublewide, Nike, PACK, Sweatbands, Swoosh by FPSports. Bookmark the permalink.